Another day, another ~39 miles or so. Kasia wanted to spend some time perusing the antique stores in Snohomish, so I thought this would be a great opportunity to put in some miles on the Centennial Trial. The trail runs from downtown Snohomish north to Arlington. Work is in progress to extend the trail all the way to the Snohomish/Skagit county line. The weather today was kinda psycho, but it looked like I could squeeze in a mostly dry ride between 1:30 and 4:30. I mostly succeeded, with only a few light sprinkles along the way. 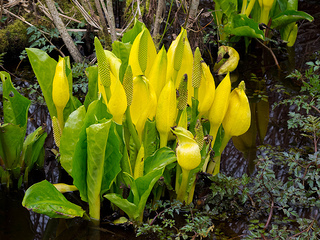 This being April in the Pacific Northwest, it's skunk cabbage season. These plants look like something from another planet, and they do indeed smell like skunk. Luckily, they have not yet reached peak skunkiness, but that's something to look forward to (?). 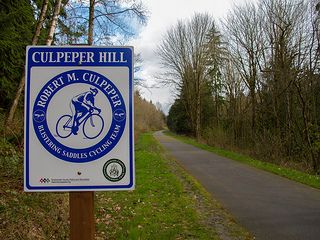 Culpeper Hill Dedication, Getchell Trailhead, April 7, 10 a.m.
Dedicating a portion of the trail to the memory of Robert M. (Rob) Culpeper, loving husband and father, avid cyclist and runner, co-captain of Blistering Saddles Cycling Team, well respected employee of The Boeing Company, sponsored by family, friends, and all who knew him. If I didn't already have plans for this Saturday afternoon, I would definitely attend, even if only to get the details on this Bob Culpeper person. He must have been a great person to have such a nice section of trail named after him.